There is an obvious outlier to the general trend (Ipsos) but otherwise everybody seems to agree: the NDP is rising while PC and OLP are dropping. This is why the polling average now has the NDP with a fairly comfortable lead. Yes some of it is due to the Pollara poll that has the NDP at 43% (!) but the trend is there. 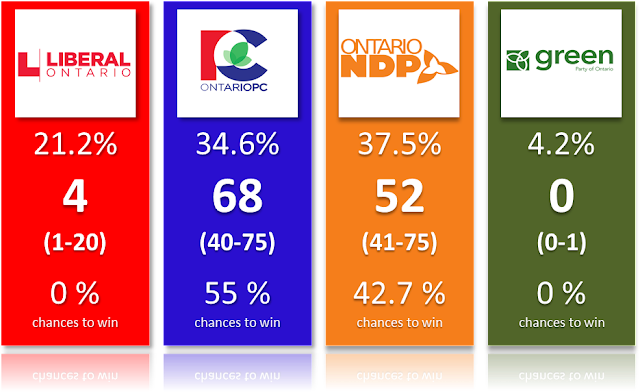 (Note: I Tweeted yesterday that my projections were showing 49% chances for both the NDP and PC. That was true but I then made other adjustments, mostly based on riding polls). 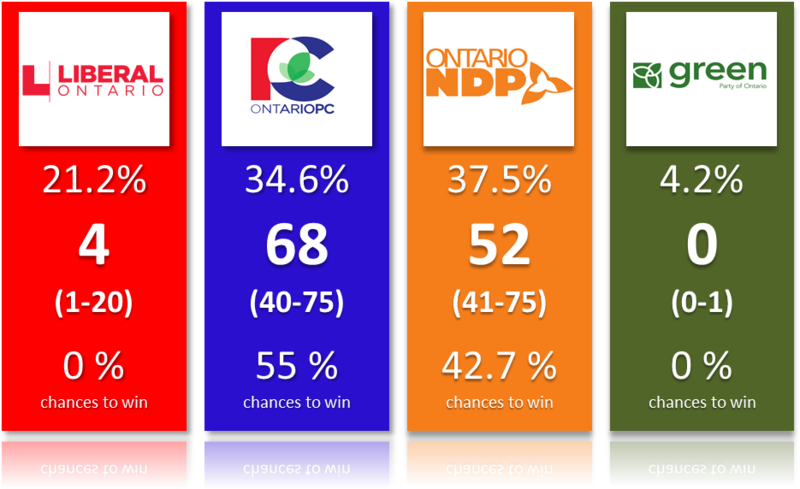 Despite the trend and a fairly large lead for the NDP in the popular vote, the projections still have the Tories ahead! How come, right? Well, I was just as puzzled as you. So here are some explanations. 1. The riding polls (all from Mainstreet) are absolutely terrible for the NDP. To the point where I can't explain some of the results. According to Mainstreet, the Tories would actually be competitive in the North and win ridings I thought were fully safe for the NDP. In other ridings like Hasting-Lennox and Addington, the PC would be currently crushing the NDP by 34 points! The NDP would actually barely have increased since 2014 despite being up almost 14 points province wide. This makes no sense to me whatsoever. This is happening in many other ridings. Based on these polls, my projections are overestimating the NDP in the East, GTA, North and the Southwest. And by double digits sometimes. 2. The model is currently projecting the PC to win a large majority of the close races (margins of 5% or less) it is involved in. Specifically, the PC would win 21 out of 29 races. That seems high. This would require a really good GOTV and/or some luck. On the other hand the NDP only wins 6 out of 19. Imagine a more likely "success rate" of 50%, the PC would then be at 62 seats and the NDP at 55, a much closer race already. I'll have to take a better look at these ridings in the next week. 3. Ultimately we are back to the topic of vote efficiency. I had previously written that my calculations were showing a 50-50 race if the NDP had a 2 points lead over the PC. My new estimations show that the NDP might actually need a 3.5 points lead! So why is that? And no I'm not actively trying to make the NDP lose. Here is what I found. The main difference is that the OLP is now at around 20% instead of 25%. And as unintuitive as it sounds, the Liberals dropping that low is actually helping the Tories! You can use the simulator to see how it works. Leave the PC and NDP where they are and increase the Liberals to 25% (yes it doesn't add up to 100% anymore but forget it for now). Did you see what happened? The PC dropped from 68 to 59 seats while the NDP only lost one seat! What this means is the vast majority of seats the Liberals have lost by dropping from 25 to 20% have gone to the Conservatives. We are talking of ridings like Don Valley West, Eglinton-Lawrence, Glenngarry-Prescott-Russel, Orléan, half of Mississauga or Ottawa South. Most of those are part of the close races mentioned in 1. It really is a weird situation right now. The PC is dropping, the NDP is rising but vote efficiency is increasing for the PC and keeping this party ahead. But make no mistake, this is a much more precarious lead than what they had before. Yes the PC is still projected at 65+ seats but this party is now in a situation where it could easily lose. A small overestimation by the polls, a more resilient Liberal votes in some key ridings or some NDP surge thanks to young voters (in Toronto for instance). Any of those (plus others) and Andrea Horwath wins the most seats. Here below are the distribution for the main three parties. As you can see, the ones for the PC and NDP overlap quite a lot. And the NDP's upper tail actually goes further. 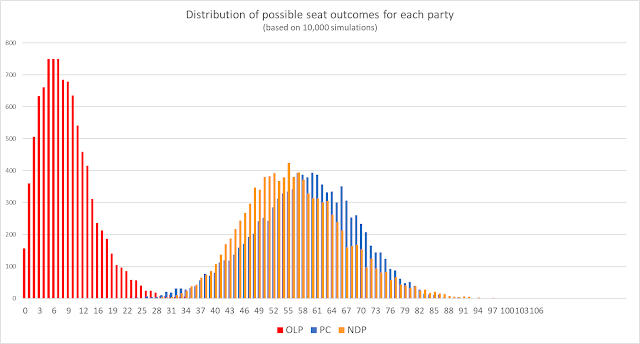 Notice also that the Liberals, at 4 seats, would clearly be scoring on the low end of their distribution and this party has the potential for way more than four seats. So don't focus too much on the 68-52, focus on the 55% vs 43%. This is almost a toss up. Factor in the trend mentioned at the beginning and the NDP isn't in a bad position. Also, it is important to realize that the NDP is experiencing a massive swing upward compared to 2014 while the PC is barely up. So my projections might be quite off for the New Democrats. Models like mine are much better suited to forecast riding level results when the swing is small. With that said, imagine if the NDP were to actually win the popular vote by 3 points but the PC were to get a majority! That could be the best argument for electoral reform in a very long time.